IMPORTANT: If uploading a print ready PDF, make sure the file includes 1/8" bleed on all sides and set to 300 resolution. Crop marks are optional. Enter your information in the spaces below, click submit, and we'll send you an e-mail to confirm that we've received it. It's that easy. FSC = Forest Stewardship Council. As an FSC Supplier we have taken extra steps to ensure the paper we use is environmentally friendly. Four color process, black/white, etc. If there are spot colors, please list. Please specify PMS spot colors, Foil Stamp, Die Cut, or other special printing specifications needed or type n/a. Please describe any finishing instructions (folding, stitching, drilling, glueing, etc.) in the field below. IMPORTANT!!! 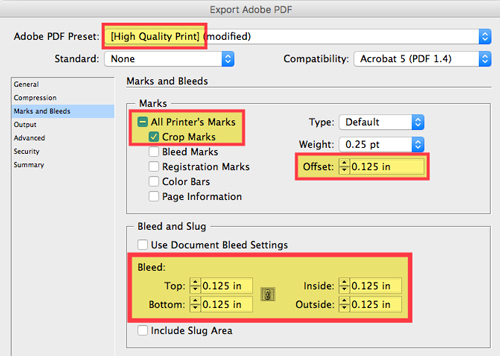 If uploading a print ready PDF, make sure the file includes 1/8" bleed on all sides. If uploading InDesign files, it is important to include all packaged files (fonts/links). Use WinZip or "Stuff-It" to compress the file before you send it. Contact your CSR with questions.